FerroECOBlast Europe’s proven Shot peening technology guarantees increased fatigue strength of up to 800 % and fatigue life of up to 1000 %. It reduces the risk of corrosion and prolongs the lifetime of most critical heavy loaded components. All Shot peening machines are built according to AMS2430; AMS2432 and are NADCAP compliant. On request, machines can be custom-built according to our customers’ specifications, depending on the part that will be processed. 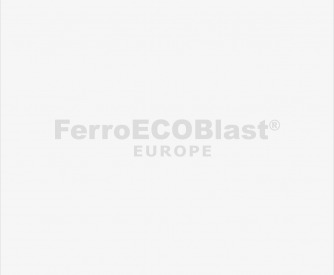 FerroECOBlast Europe provides high-tech solutions and exceptionally perfected equipment used on the most demanding parts of the aeronautical, automotive and other industries. Shot Peening is a cold working process in which the surface of a part is bombarded by small spherical media called shots. Each piece of shot striking the metal acts as a tiny peening hammer imparting a small indentation or dimple on the surface. In order for the dimple to be created, the surface layer of the metal must yield in tension. Below the surface, the compressed grains restore the surface to its original shape producing a hemisphere of cold-worked, highly stressed metal. Overlapping dimples develop a uniform layer of residual compressive stress. Shot Peening is often called for in aircraft repairs to relieve tensile stresses built up after machining and heat treatment processes and replaces them with beneficial compressive stresses. The compressive residual stress in metal alloy is produced by the transfer of kinetic energy. The aerospace sector is one of the critical sectors and always follows high standards and only specialized companies like FerroECOBlast Europe can fulfil their high demands. It is mostly used to improve the mechanical properties of components that are under constant stress. It is a known fact that cracks will not initiate nor propagate in a compressively stressed zone. Because nearly all fatigue and stress corrosion failures originate at or near the surface of a part, compressive stresses induced by Shot Peening provide significant increases in machine part life. The magnitude of residual compressive stress produced by Shot Peening has at least half the strength as the tensile of the material being peened.